Probably the best outdoor pools are the in-ground type. We all know that it’s not always feasible to build one. There many obstacles that may prevent homeowners from building a loved pool, such as space, laws or community regulations. Even if one had the space and the laws allowed them to dig a pool, the costs and time associated with this kind of project, are other important barriers to consider. If you don’t own your own house or the regulations and money prevent you from having a traditional swimming pool, you can consider getting one above the ground. This type of pool is temporary the most preferable for people during the hot summer days, or for their kids to enjoy when they’re still small. Don’t worry if you have never owned a pool and have no idea what to take into consideration when purchasing one. Here we’ll try to provide a short presentation of the pools as well as the most important features to look at before paying. One of the first things to know about such pools is that they come in many different sizes, several shapes and they’re generally very easy to install. Some models are completely inflatable, others have an inflatable top ring, while others need a frame that supports the wall of the pool. When searching for swimming pools above ground, there are a few key features to consider. One of them is who will use the pool the most, including whether you have kids or pets, or not. There are many age appropriate models of pools, and the younger or smaller the user, the smaller the pool should be. Really small completely inflatable pools are perfect for toddlers. Some pets love playing in water or swimming, but their claws can damage any inflatable parts. As we mentioned size matters. With bigger pools you might want or need to use various accessories, such as ladders or building a deck around them, to make it easier to go in and out of the water. Depending on the size of the pool, you might have difficulties in finding it a spot in your garden. Remember that round pools take more space than the rectangular models. In many cases the size influences the price. While a pool that can be set up and then removed is cheaper than a permanent one, there are a few extra costs to owning one. There are many models out there that require a filter pump as well as some solution to clean and purify the water. Many times the pump you receive in the kit for this type of backyard pools, is too weak to use. Covers, bottom protectors and ladders are sometimes not included or not good enough and an extra purchase is in order. At other times you might need to perform maintenance on your pool and this could cost extra money. All these costs exclude the cost of water and electricity that might be reduced when compared to a traditional dug out pool. You should know that most models must be laid on an even terrain. A slanted surface can put more pressure on the wall of the pool, and it could tear or collapse in the end. If the area has a lot of bumps or holes, then the bottom is at risk of getting damaged. Most medium sized pools can be used for varied purposes, such as lounging around, allowing your dogs or ducks to swim, or even as a temporary fish tank. All children should be supervised in and around the pool as well as taught how to swim. It’s also advisable to fence off the pool area when it is not being used, to avoid accidents..
Now let’s see some products you could consider. 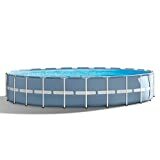 This pool made by Intex is built with laminated sidewalls and doubled with a band that keeps it secure. Made with strong, 15ft x 48in steel frames, the pool is durable and ideal to use during the hot summer days. Although it does not come assembled, the pool is ready to use in only 45 minutes and comes with an easy to watch DVD that provides all the instructions. The cover protects the pool from debris and uses a tie to keep it from being blown by the wind. Furthermore, the filter pumps up to 1000 gallons per hour and is easy to clean and install by simply attaching the hoses. The pool bottom is protected by the durable ground cloth found in the kit. 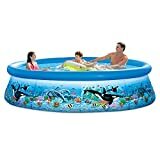 If you have children, consider this Bestway pool as one of your options. 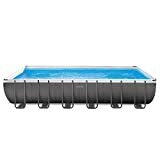 Due to its 118 x 79 x 26 inches size and rectangular design, this pool is very easy to set up and remove whenever you need. The outer wall is made of durable PVC and polyester, while the frames are entirely made of steel. Unlike other similar small above ground pools, the Deluxe Splash Frame has been built with convenience in mind and can even be used by beginners. With an 872 gallon water capacity and a flow control drain valve which hooks up to a hose, the pool is both deep enough and easy to maintain. The product weighs 43.5 pounds, and is not recommended to use of soft soil. An instruction manual is provided for easy set up that does not take more than 40 minutes, however filling the pool with water might take a couple of hours. This is an above the ground pool that can meet the requirements of any family. Measuring 15ft X 48 in, the pool features triple strong, powder coated steel frames for extra strength. If you are wondering about safety, you should know the pool includes a ground fault circuit interrupter, which shuts down the electric system if exposed to water. 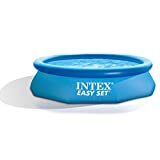 This easy set pool comes with an instruction DVD that allows for a 40 minute installation time. Along with the item you will also be getting a cover that protects the bottom, a top cover that keeps away debris and a 1000 gph pump. 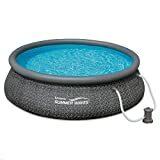 One of the downsides of getting this pool is its lack of a warranty period, as a few customers reported they could not return their defective item. Furthermore, it has been noticed the bottom rope is missing from the package which can make the pool more difficult to set up. Measuring 12 ft x 30 in, this pool is the smallest within its group and thus one of the best swimming pools for children. Its 110-120 volt filter pump is easily attached to the hose for fresher water, and its set up time does not take longer than 10 minutes. This pool doesn’t come with an instruction manual but a DVD that explains the setting up process. With a 1,485 gallons water capacity and dual suction outlet fittings, the pool is both spacious and more hygienic compared to similar products. Its 530 gallon per hour filter pump is strong enough to fill the pool in about 3 hours or less, but you might need additional filters for increased strength. This item includes a secure top cover that protects against debris. 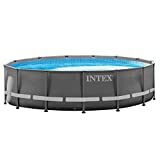 Just by seeing the picture of this Intex pool you can realize how to fit it for use, however you can also check out the DVD containing important information about setup and maintenance. Here you have a pool with an inflatable ring at the top meaning that you can only use up to 80% of its capacity. The product can only hold about 1000 gallons of water, but you have to buy a separate pump to fill the pool. The item is very lightweight when empty as it weighs under 9 pounds. Like many other similar temporary pools, you’re advised to place a protective mat under it before filling it with water. The mat could be made of tarp or any other similar material, but make sure it is placed on a flat surface. 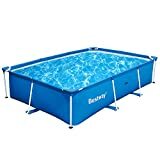 The rectangular pool designed by Bestway is a good size for older children. It measures 94 x 59 x 23 inches and can hold up to 470 gallons of water when filled 90%, as it is recommended. The sidewalls are made of heavy-duty PVC in combination with 3-ply polyester. At the dimensions this pool has, up to 10 kids can enjoy it at once. At least 2 adults can enjoy the pool. If you want to use it for the dogs to swim in, it might be better to have a deck around it for protection. Speaking of protection, you’ll have to purchase a cover and a ground mat as well, as they’re not included in the box. Some folks might have troubles understanding the instructions, though the unit should really be easy to set up. Here you have more than a pool: you have a play center to keep your kids busy on hot summer days. This set contains a water slide, water sprinkler, wading pool and a ring toss game set. The pool can hold up to 77 gallons of water. Some parents use it as a ball pit instead, with about 500 balls in the lower part of the pool. Be warned though, that the center and its accessories are all inflatable. You’ll have to make sure the pets don’t come near the center unlike with hard sided pools. The water sprayer should be attached to a garden hose and its purpose is to keep the children cool.The center can be used by children between the ages of 2 and 8. It can fit 4 or 5 kids, depending on their age and size. Summer Waves suggests a pool with a PolyLaminate PVC wall that has a polyester inner mesh for durability. To enjoy this pool all you have to do is to find a leveled surface, lay the product down, inflate the air ring and fill with water. Make sure to stop filling when the water is a bit lower than the air ring. Given its 36 inches height, this pool doesn’t require a ladder to go in and out, except for maybe children. 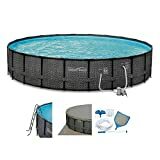 You should consider getting a cover as well for this pool as there isn’t one included in the package. Given its air ring, it’s advisable to keep pets away from the product to avoid damage caused by their claws. If you want to improve its life span, also consider placing a tarp under it before adding water. Older kids would love spending some time around this pool, even setting it up. All there is to do is just to find a flat surface, inflate the ring and fill it about 80% with water. This adds up to about 1000 gallons of water. It’s very important not to fill more than the instructions say and keep the water’s level under the air ring or else the seams could come apart. There’s a DVD with setting up instructions as well, for those who never had a pool before. To make the water filling process easier, make sure to use either the included pump with a 330 gph flow rate, or any other water pump you might have. To empty the pool, there’s a plug to which you can attach a garden hose. The side wall is made of laminated PVC of improved resistance. The product can fit about 6 children with space to spare or 6 adults quite comfortably. 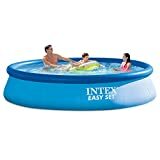 The Intex Ultra pool suggested here is the round type and can be filled with more than 3000 gallons of water. The water will be 36 inches deep when the pool is completely full. Upon purchase, you’ll receive a DVD with instructions for setting it up and for maintenance purposes. This pool comes with an improved dual suction outlet fittings that have the role of improving the circulation of the water. A better water circulation leads to a clearer and cleaner water to bathe in. The manufacturer also improved the ladder so now it is more stable and offers more support as well. Several customers stress the importance of laying this pool on a leveled area. Just like with most similar products and models, no salt or sand for purifying the water, is included in the kit. Other people complained they received painted pipes that are prone to rusting. 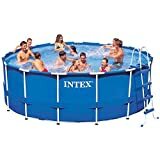 The Intex Prism Pool is a circular type of pool available in several sizes, and even in a classic rectangular shape. This model is the one with a 24 feet diameter and 52 inches tall. Everyone over the age of 6 can enjoy this free standing pool Prism pool. The item has a powder-coated Steel Tubing and its wall is made of 3-ply material. The material is strong enough to stand the claws of a dog. This product can be filled with more than 12,000 gallons of water at a rate of 500 gallons per hour. However, some customers say it’s better to use a different one that is more powerful. Some customers have complained there is no ladder included in the kit, despite the product’s description that is has one. Many clients praised the product for being easy to set up and the instructions come as a DVD that you can stop for each step. 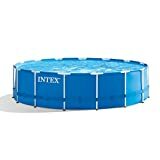 Intex suggests you check out their rectangular pool that is 24 x 12 feet. It has a powdered steel frame so you can be sure rust won’t affect it. On top of this, the powdered treatment also gives the pool a special appearance. The wall of the pool is made of laminated PVC. You can fill it with more than 8000 gallons of water and expect some 45 inches water depth. The package contains a sand pump, ladder, cover and ground cloth. The pump is a Krystal Clear Sand Filter type, of 2,100 gph. There’s a drain plug that can be easily connected to a garden hose so that you can direct the water wherever you want. Most complaints about this product are related to the quality of the accessories as most people recommend getting others. The ladder and the cover are the main parts others complain about. You also need to purchase a net to clean it, as it’s not included, just like with most collapsible pools available. Here you have a 22 foot x 52 inch pool that takes about an hour to set up. The kit comes with a water pump that can filter up to 2000 gallons of water. Upon purchasing the Summer Waves pool you’ll also receive other needed items: a cover, a ladder, ground cover as well as a maintenance kit. The frame is made of steel known to resist the elements as well as the stress of the water when the pool is full. The wall of the pool is made of PVC and can hold over 10,000 gallons of water. For this capacity you should expect some 13 hours of wait for it to fill with water. Children can enjoy this pool as well, if they’re at least 5 years old. Larger sized folks should find another ladder as the provided one could be too narrow. Several users recommend using another pump than the one you receive. When choosing the best above ground pool reviews can make all the difference. There are simply too many options available and sometimes, a person could find more than 1 product matching their needs. Hopefully you found this presentation useful. Surely no matter which product you choose, you’ll have a wonderful time.